One church group hands out 20,000 meals over the course of two and a half-hours, twice a day. LUMBERTON, N.C. — A line of cars stretched as far as the eye could see down N. Roberts Avenue as about 125 volunteers at the Hyde Park Baptist Church prepared to hand out 20,000 hot meals and bottles of water. 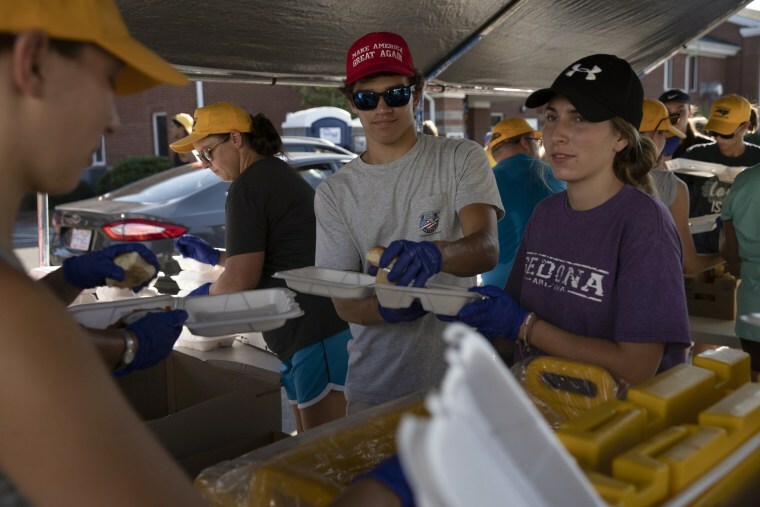 Volunteers are here twice a day, working from an outdoor kitchen and helping tens of thousands who are in need after the destruction of Hurricane Florence. Gregg Riggs, the disaster relief team leader of North Carolina Baptist Men, said he expected around 8,500 cars to roll through this church parking lot over the course of 2 1/2 hours beginning at 6 p.m. ET. People were handed hot meals in Styrofoam containers, sometimes four at a time. In one case, that meant chicken patties on rolls, with sides of carrots and apple sauce. The group would be back at 11 a.m. the next morning to start handing out lunch, and would continue to feed people for however long they deemed it necessary. President Donald Trump visited a similar kitchen that was also run by North Carolina Baptist Men and Baptists on Mission earlier this week when he came to see the devastation caused by Hurricane Florence. The organizations have nine mobile sites throughout the state. The organization's volunteers were still here working on post-Hurricane Matthew recovery projects caused by 2016's heavy flooding when Hurricane Florence hit the coast late last week. They hoped to restore 200 houses for residents here, but they hadn’t quite made it to that number when Hurricane Florence rolled through and devastated the same area. And it’s mostly predominantly black neighborhoods here that have been affected by the flooding — a disaster that is nearly a mirror image of the damage caused by Matthew. Floodwaters still present Saturday were expected to remain a problem for another week or more and homes continued to be inaccessible. Store doors were kept shuttered and hundreds in the area still did not have electricity, according to Duke Energy. Allen helped direct two lines of traffic through a parking lot that wraps around this massive brick church. Standing in the shade of the church’s steeple, she noted that Lumberton remains one of the most impoverished communities in the state. While Allen’s home hadn’t been affected by the flooding — though she was prepared to deal with a few fallen trees — not all the volunteers were quite as lucky. Bradley Abbott, 18, is a student at the University of North Carolina Pemberton, but as of now he, along with his father and brother, are homeless. He said his father is devastated, as the house is all he had. It’s the second time that Abbott’s father has had to grapple with hurricane damage after Matthew overwhelmed the community in 2016. This is the second round of flooding in two years that can be considered a near 100-year flood, or having a statistical 1 percent chance of occurring in any given year. It's taken a heavy toll on residents, according to Riggs, the disaster relief team leader. But the volunteers here expected to continue handing out meals and helping to rebuild Lumberton — no matter how long it takes.